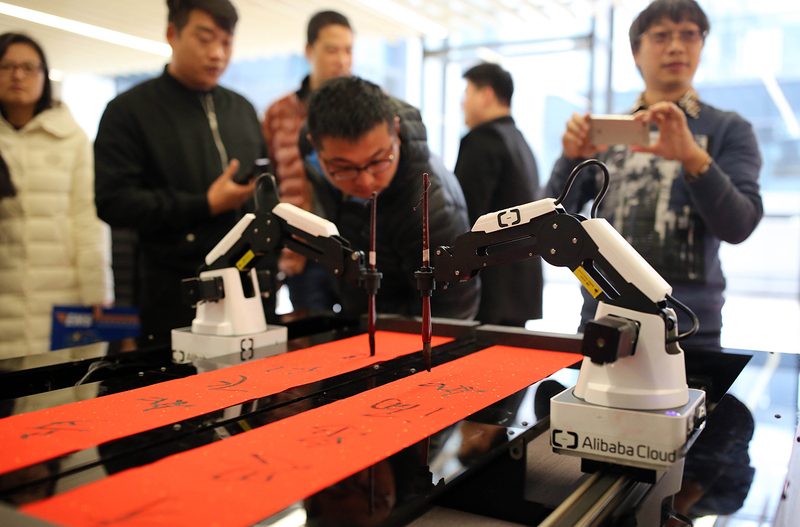 Alibaba employees watch an artificial intelligence robot named ET writing Spring Festival couplets at Alibaba’s Xixi District in Hangzhou, Zhejiang, January 16, 2017. Kai-Fu Lee is one of the most prominent figures in Chinese technology. He founded China’s noted early-stage venture capital firm Sinovation Ventures after launching and heading up Google’s China operations during their years of growth from 2005 to 2009. Born in Taiwan and educated at Columbia and Carnegie Mellon, Kai-Fu had an early career in Silicon Valley, including a stint as a principal research scientist at Apple. Microsoft brought him to Beijing in 1998 to set up a research division, and he has seen the rise of the Chinese Internet from its earliest days. Kai-Fu has more than 50 million fans on the social media platform Weibo and is a much-loved public speaker and author. He is perhaps most admired for his gutsy investing in Chinese startup companies: Sinovation puts money into startup companies in their riskiest early years, or even months. Kai-Fu founded it in 2009, at least half a decade before the world began to take Chinese innovation seriously. He was an early believer in mobile companies when many investors were still seeing the Internet as a desktop world. Now Kai-Fu is turning his attention to artificial intelligence (AI), and he spoke to Kaiser and Jeremy about it for this podcast at—of all places—the Trump International Tower in midtown New York City. Jiayang Fan, from The New Yorker, was finishing off an interview as they arrived, and she stayed for the chat. The discussion ranges from new technologies that are coming from Chinese engineers to the inexorable rise of artificial intelligence and how it will change the way we live, work, and think.